I had a chance to interview Robin to learn more. 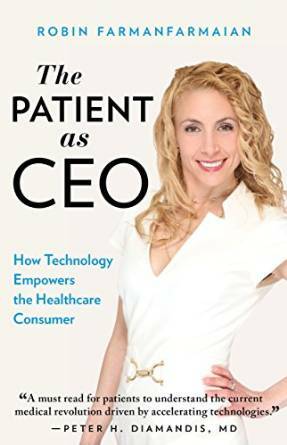 What does it mean for the patient to be CEO? Just like with a CEO of a corporation, where you surround yourself with am amazing array of Vice Presidents, support staff, advisors, board members - as CEO you enable them to do their jobs, they report back to you and as a team, you decide on a direction for the company to go into. But, as CEO, you are the one who is ultimately responsible that the vision is carried out, and the company as a whole is successful. Why should being a patient be any different? As a patient, surround yourself with your healthcare professionals, physicians, nurses, technicians, therapists, etc – enable them to do their jobs by providing access to your software and hardware (your body, labs, brain, tests), and then they report back to you. As the Patient CEO, you are the one in charge to make decisions based on your team’s advice, and you are the one who needs to make sure that vision is carried out by making appoints, adhering and complying to the treatment plan you came up with together, with your team. It’s your body, and your life – you should be the one in charge and the final decision maker. Why is it important for patients to participate in decisions about health and treatment options? It is very important for patients to participate in medical and treatment plan decisions. The patients are the ones who experience the treatment, pain, side effects, surgeries, hospitalizations. They need to be in on the decisions – they are the ones going through the experience without a break, no one else is. When you leave your 15 minute doctor appointment, that doctor is on to the next patient, then eventually home that evening, with their families, own lives, not thinking about you. You as the patient are living with your body and health 24 hours a day, 7 days a week. Why would you allow someone else to be the decision maker on something that important? According to a Nationwide study recently released by the Society of Participatory Medicine, an overwhelmingly 88% of patients believe working with their healthcare providers as a partner will help with their health. When patients are on the team making the decisions, it means they need to be educated and really understand what they need to do to maximize their health and wellbeing. When the patient is the one making the decision, there will be a higher level of compliance with the treatment plan, and outcomes will dramatically improve. How have recent medical developments enabled patients to take more charge of their health care? Recent medical developments have greatly enabled patients to take more control over their health. Access to information is one of the biggest advancements that empower patients. When I got sick as a teenager, my only access to health information included the library with hard-to-read medical textbooks, my doctor or healthcare provider every once on a awhile for a few minutes, and magazines. Today, there are many reputable, accurate, easy to understand places for patients to get information they can take action on. Including some of the websites I trust like the Mayo Clinic, Harvard, NIH, HHS, Cleveland Clinic – I get information from sites that use the power of the crowd. For instance, Crohnology is a disease specific social networking site for patients with Inflammatory Bowel Disease. I can use Crohnology to talk to other patients experiencing similar health issues. I can get hints, find out what medications or therapies are working for other patients, what foods help or hurt, even coping advice on what works for other people living with this same disease 24 hours a day, 7 days a week. There are many other disease specific peer-to-peer networking sites, as well as some overarching ones like PatientsLikeMe. Wearable technology is also on a major upward trend. According to that same survey released by the Society for Participatory Medicine, 84% believe self-tracking with devices and apps, and sharing it with their health team, would help manage their health. We’re seeing a wide array of fitness trackers of course, but many other ones specifically for the clinical space. WEMU has designed smart shirts to track seizures for epilepsy. Other companies are working on socks that measure gait for neurodegenerative disease, contact lenses for continuous glucose monitoring, smart shirts for EKG monitoring, and wrist watches for blood pressure monitoring. We’ll see an even bigger explosion of choices over the next 2-3 years. How have your health struggles encouraged you to take charge and become CEO of your health care? I might not be alive today if I hadn’t taken control of my life – and I certainly wouldn’t have the life I have today. 10 years into my misdiagnosis, my doctors were telling me I was “cured” since they removed my entire colon – thus cutting out the disease (an incorrect diagnosis). I decided my doctors were wrong, and I changed out my entire team. Pain doctor, to GI doctor, to Internist, to endocrinologist – I found new ones that worked with me, as a peer, collaboratively, inclusively, respectfully. That led to a correct diagnosis, treatment plan, and after a 13 year struggle, I was put on the correct medication, and my life changed overnight. I went from being a patient who was too sick and in too much pain to function, to an entrepreneur and professional speaker working 40-60 hour work weeks! My message to all patients, everywhere: Take control – it’s your life, it’s your body, it’s your health.